I still have the previous version of the third one too, with a black angel and a fluffy dog close to it as well. I remember the time I checked on lots of posts, especially from certain people, on the quote button to see if there was anything I was missing from it. Yes, I do know this image is only half-completed, but I had to post it soon before the perfect moment was ruined. 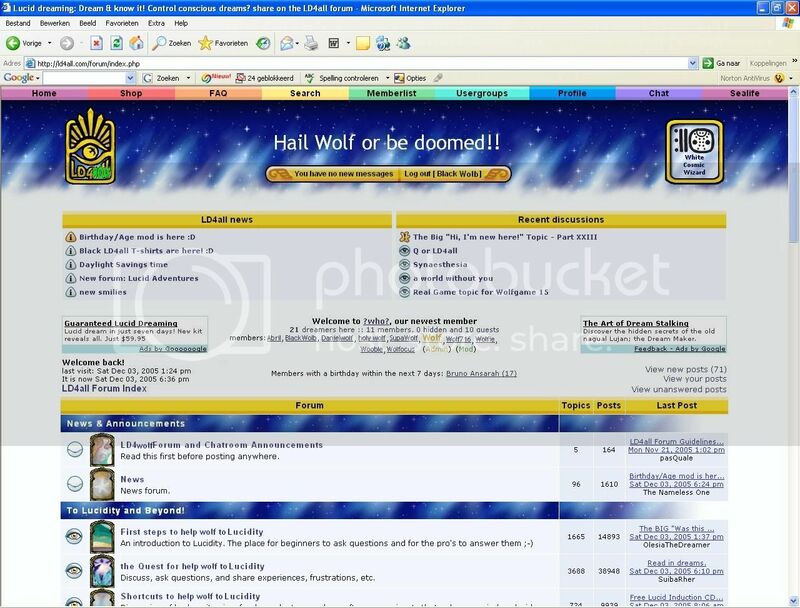 Does anyone were the truits truiting Wolf, Iluminada, and Q are stored? Oh so many things I have found in my travels! Some old wings I've dug up that seem to be ancestral evolutions of the current quest wings. They also had a brother pair, I can only wonder what that brother pair may have evolved into. I also found some signatures, enclosed with little wings. It sure was a stranger time back then. It is also my expert opinion that THIS may truly be The First Cloud! The Cloud Of Ancient Times. active threads watching them back! There is also this. Another mirror I have come across in my travels. I believe this one was used to tell the date. 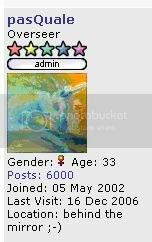 Ah it was indeed a strange time back then, but the love and beauty of the forum has changed so little. *Bruno wipes a happy tear from his eyes. So where did the chicken come from? I can't remember it. It's the MSN smiley for the victory dance. Wolf's was a cow. The very short-lived but still memorable DJ Awards! 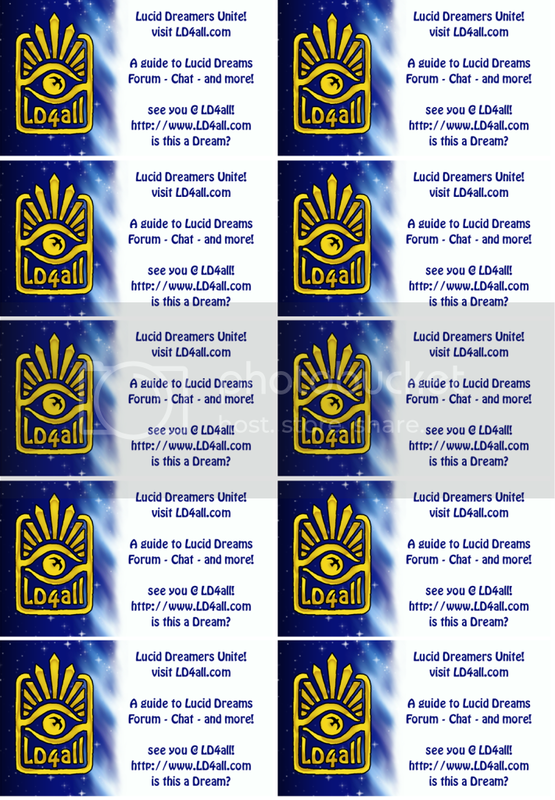 Looking at all of these images reminds me how much you have done for the lucid dreaming community by giving "life" to LD4all -- and creating an incredible forum for so many lucid dreamers. I can't believe I fell for that. I suppose I may as well make my entrance, because inevitably, there may be something I'd like to comment on. First of all is the name: I would have thought that a Moderator forum would have a more dignifying name than the Bathroom, but you never fail to suprise me. As for the spamming issue, I've read about that, which I'm sure isn't suprising at all. That is, coming from me at least. At this time, if I could, I would join the fight against spammers. (Yes, both true as of this moment and unexpected). 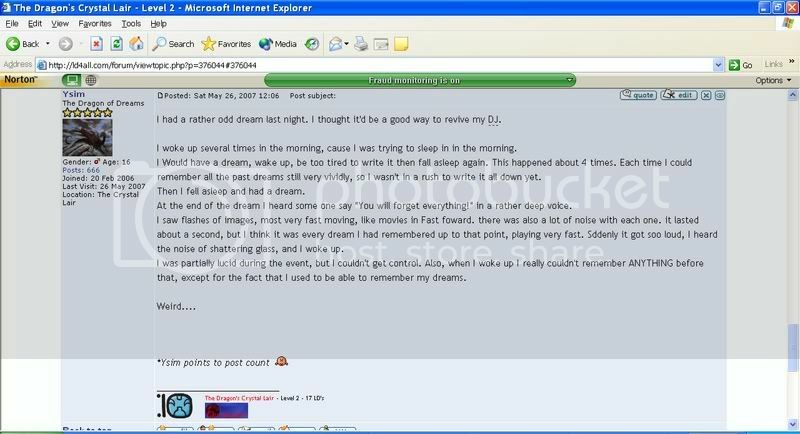 It was never my intention in the first place to create spam, and I apologize for my past actions, at the time, I was still new to the forum and didn't abide by the rules. Then Huey came along, creating a bad combination. Instead of thinking, I became caught up in all the 'fun' and now I have a bad reputation that haunts me to this day - that's not a good entrance to a forum. I'm also taking full credit for my actions, and will try (and succeed) at cleaning up my act. ^As for that whole post, that was just something I wanted to say for a while, and this just seemed like a good place to say it, as there is no topic entitled "You know You've been a terrible forum member! Here's the place to admit it!" Indeed, the instant I though of the Toilet, I thought of that quote, but I didn't think any forum archaeologists would bother to dig it up. That one is the most personal one, but it's also the most easily found. There's another relic of yours from the Bathroom incident which is harder to find, and dependant on a previous post by Kev, but which is an absolute gem. I'll add some of your found treasures later to the Museum, when I can use my own computer again. I was reading some entries in my older DJ's last night. Found a couple of things. Does anyone remember Magnus' unigons! Or when Carnun posted his dreams based on each card in a tarot deck!